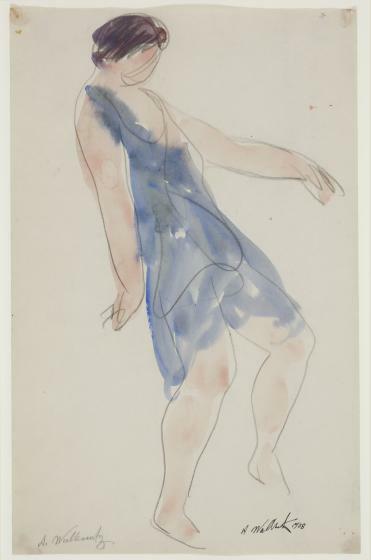 In 1906, while visiting the studio of Auguste Rodin in Paris, Abraham Walkowitz first met Isadora Duncan, the most celebrated and innovative dancer of the era. This encounter marked the beginning of a relationship spanning the next three decades in which Walkowitz made a series of thousands of drawings of Duncan. She was credited as the inventor of modern dance, dressing in free-flowing costumes with her hair loose and her feet bare and using her solar plexus and torso as the impetus for her movements. Walkowitz sketched her quickly, trying to expose her directness and dynamism. His drawings of Duncan, or, as he called them, his “calling cards,” are some of the only authentic records left of her dancing, as she never agreed to be filmed. William Keyse Rudolph, DMA label copy, 2005. 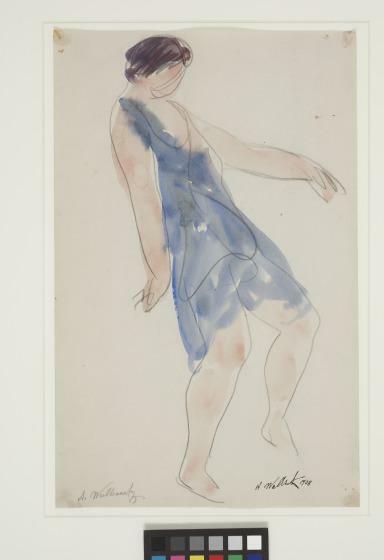 View more watercolors of Isadora Duncan by Abraham Walkowitz at the Brooklyn Museum. Learn more about the life and works of Abraham Walkowitz at the Reynolda House Museum. Explore other works by Abraham Walkowitz at the Whitney. Watch this video to learn more about Isadora Duncan created by isadoraNOW. Read an interview with Abraham Walkowitz from 1958.